I’ve been deep in my writing cave, working on a new book, so I’ve neglected to share some news I’m thrilled about: my story “Honor Thy Father” is in the Winter 2019 edition of Mystery Tribune. 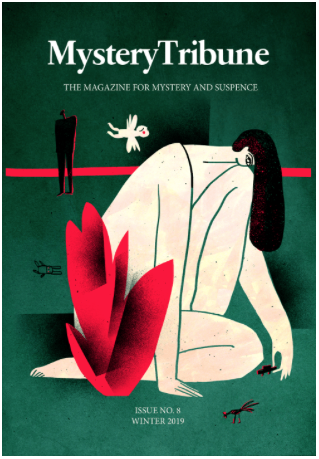 If you haven’t had the pleasure of discovering Mystery Tribune, do yourself a favor: it’s a gorgeous magazine—available in print and online—filled with short fiction, interviews, reviews, art, and photography. “You want a Coke or something?” the cop asked. “No, thanks.” Jacob looked down. They were seated across from each other at a blond-wood table that bore deep scars from years of abuse. There was a sticker with a shiny palm tree affixed to one sturdy leg, likely covering up some particularly offensive graffiti. Jacob wondered if it was the same table from the last time he’d been in that windowless interview room. It bothered him that he couldn’t remember, even though it had been five years ago. Another lifetime, almost. Jacob eyed him warily. He was so nervous, the cop’s name had slipped out of his mind as soon as he’d heard it, like a drop of water through a sieve. That bothered him, because details were important. He had to focus, so he studied the man in front of him. The cop was almost as broad as he was tall, with a furry fringe of graying hair, sunburned red skin, and a walrus mustache. Jacob had no doubt the man was tapped to play Santa Claus year after year at Christmas. He gave Jacob a broad grin, like he thought the two of them were bonding over a shared love of cookies. But Jacob grimaced at being called a kid. He was only fifteen, but he was already almost six feet tall, with a deepening voice that people were starting to mistake for his father’s over the phone. Jacob realized the cop wasn’t as dumb as the goofy chatterbox he played. His chin sank towards his chest and he took a shuddering breath. Suddenly there was a beefy hand, deep red as a lobster claw, on his shoulder. Here’s hoping you’ll want to know where “Honor Thy Father” goes from there. Print editions of Mystery Tribune are available from Artbook @ MoMA PS1 and The Mysterious Bookshop, and directly from Mystery Tribune’s own site, where there’s also a digital edition. This entry was posted on Tuesday, March 12th, 2019 at 3:25 pm. You can follow any responses to this entry through the RSS 2.0 feed. You can leave a response, or trackback from your own site.